During the day I work for a totally awesome physical therapy practice in NYC with a beautiful, huge glass jar filled with…. candy! And, while not everyday, I often find myself reaching in to satisfy my craving for something sweet. This week, instead of gorging on Hershey’s and Nestle, I’m filling fists with a homemade superfood snack mix. Not only is my concoction an antioxidant powerhouse, but it’s packed full of protein, iron, calcium, magnesium, potassium, resveratrol, copper, phosphorous, Vitamin A, C, B6 and more. So what’s inside? Mulberries, gogi berries, unsalted roasted pistachios, raw unsalted almonds and cacao nibs. Enjoy. 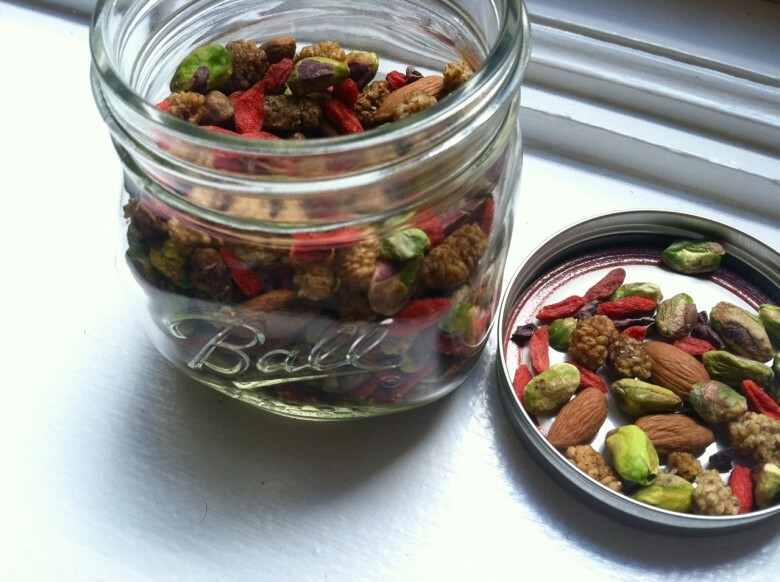 March 29, 2012 | Filed under MIY (make it yourself), snack and tagged with cacao nibs, gogi berries, homemade, Mulberries, pistachios, raw unsalted almonds, snack mix, superfood.